played on Monday, 18 November, 2002 at 7.45p.m. BACKGROUND The UniBond Cup has reverted to a knock-out format for this season and as a top-ten finisher in the league last season, Altrincham were exempt until this stage. Not only did Altrincham go out of the UniBond Challenge Cup, 1-2 against Hyde United at Moss Lane last night, they had Richard Acton and Peter Band sent off. Troy Hayder scored a strange opening goal after just 3 minutes following a goalmouth melee, before Alty's 17 year-old debutant striker Steve Lunt netted a fine volleyed equaliser (11 mins). Just a minute later Meszaros was given plenty of space to drive home a shot from the right of goal to restore Hyde's lead. Despite a lot of possession Altrincham could not score in a second half. Then in the second and last minute of added time Richard Acton caught a punt from the Hyde keeper just outside his own box as Foster closed on him. Referee Tarry sent him off then, after the whistle had gone at the end of the game, he also showed Peter Band a red card for a verbal offence. With Andy Moore now at Trafford, Altrincham now have a major goalkeeping problem looming. The performances of youth players Steve Lunt, Jon McEvoy and Francis Evans gave some cause for consolation to Alty fans. 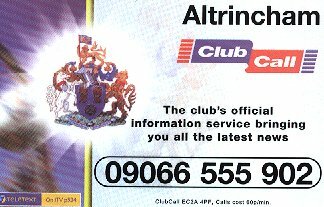 Altrincham now go into the President's Cup draw. Altrincham were without their regular centre-backs, Mark Maddox and Gary Talbot, through injury, whilst leading scorer Rod Thornley was absent on duty with the England team. Vernum Rowland was also missing with an ankle injury. The absences gave openings for Steve Lunt, who started the game, and his fellow youth teamers Jon McEvoy, Francis Evans and Luke Killeen, who were on the bench. None of them had yet played for the first team, though Jon had been on the bench last week. Jon and Francis are midfielders whilst Luke is a striker who has represented Bolton & District Schools and was on Bury's books. 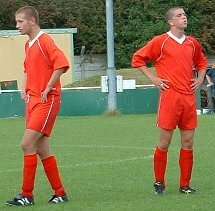 Pictured right are Francis Evans and Jon McEvoy, playing for Altrincham FA in September 2002. Jason Gallagher and Danny Murphy, both of whom have been injured recently, started the game but neither was able to complete it. Peter Band and Richard Acton were both playing against their former club and there were some Hyde players doing the same. The Tigers have a large contingent of recent ex-Alty players in their squad but although Kevin Hulme, Dave Swanick and Anthony Hargreaves did not play tonight, Ryan Hevicon did play, as did former reserve striker Lee Evans. In fact it later emerged that Hargreaves had left the club at his own request. On the Hyde bench was Leon Smith, who also had a brief spell at Moss Lane. The transfer listed Paul Ashwell also started for the Tigers. Referee Mr Tarry had been the man in charge of Graham Heathcote's testimonial game in 2001 but in the light of the two dismissals and the missed penalty-award in tonight's game, his visit to Moss Lane this time was less happy. He had more recently been at Moss Lane to officiate in the friendly against Blackburn Rovers in the 2002 pre-season. HYDE UNITED (Yellow shirts and socks, white shorts): 1. Steve LYONS, 2. Scott WESTWOOD, 3. Paul McGUIRE, 4. Dominic CROOKES, 5. Paul ASHWELL, 6. Rick WHELAN, 7. Michael MESZAROS, 8. Troy HAYDER, 9. Lee EVANS, 10. Tom BROOKES, 11. Ryan HEVICON. Subs: 12. Steve FOSTER, 14. Leon SMITH, 15. Peter CROOKES. On a cold night in front of a small crowd, Hyde won a corner on their right in the second minute. Taken by Meszaros, the corner-ball caused Alty problems and a shot appeared to be half-cleared before a follow-up was allowed to trickle into the net, just inside his right hand post, by Acton. The Alty keeper seemed to make little effort to stop it, possibly because the referee Tarry had signalled a goal even before the follow-up by Hayder had crossed the line; all in all, a curious goal! From the restart, Hyde keeper Lyons missed a through ball before recovering to hold the ball. Then former Macclesfield player, Meszaros, got in a testing 30-yarder which Acton saved well, diving to his left (7 mins). Next Craney received an Adams throw, turned well and lashed in a shot which went narrowly wide of the Hyde net (8 mins). However, Alty did equalise soon afterwards when the Hyde defence stopped to allow a well-struck ball down the middle by Scott to find Steve Lunt. The young striker showed great composure to volley the ball home past the Hyde keeper for a goal on his first start for the first team, after a brief substitute's appearance last week (11 mins). Steve had scored in the last minute of the previous day's youth team game so this effort made it two goals in 12 minutes at different levels for him. Parity lasted barely a minute before a pass found Hayder to the left of centre of the Alty box. The ex-Flixton man relayed the ball to his right to the unmarked Meszaros who took a step or two forward before lashing the ball past Acton, who got a hand to it, as it rose into the top of the net (12 mins). After 20 minutes Rose made a fine retrieving tackle after Hayder had got the better of Scott. Play was entertaining but both sides were making mistakes and Alty manager Graham Heathcote was moved to shout to his defence that "The four of you look as if you've never defended in your lives" and when the ball ran out of play he kicked it away in his anger. Graham's words had some effect as Altrincham slowly improved and Band narrowly headed wide a punt upfield from Acton (25 mins). Next, Murphy broke forward and found Lunt at an acute angle to the left of goal. Lunt managed to get in a cross shot with his left foot which just evaded Peter Band, coming in at the back post (27 mins). Then Ashwell lost the ball and Band turned well to lay the ball off to Tunnicliffe. His shot from 25 yards forced Lyons to make a decent save (29 mins). The sides traded attacks but Alty's best effort at this stage was a shot by Band which he lifted into Golf Road after good work by McDonald. Tunnicliffe then sent in a 30-yard skimmer which was comfortably stopped by the Hyde keeper (36 mins). Next, Craney and Band combined well on the Alty left but Craney took a step too far as he closed in on goal and snatched his resulting shot wide of the keeper's left post. Openings were being created but the chances were going begging. Alty won their first corner after 38 minutes as McEvoy prepared to come on for the obviously unfit Danny Murphy, which he did a minute later. Another chance came when Adams and Craney linked well but Lunt's snap-header at the near post from Craney's cross flashed wide of the upright (40 mins). As a Hyde player received treatment just before the break, Graham Heathcote turned to Youth team manager George Heslop and said, "George, go and get me another seven of your youth team". He had obviously been less than impressed by some of his more senior players and the half-time team-talk was probably quite interesting! Young Jon McEvoy made a great impact at the start of the second half. Firstly, he picked up the ball on the right before cutting inside and shooting narrowly wide with a low, left-foot effort from 20 yards (46 mins). Then, he fed Steve Lunt whose shot from the right of goal was tipped into the side netting at the near post by Lyons for an Alty corner on the right. Band glanced Adams's corner-kick just wide with a header. More good work on the right by McEvoy took him past Crookes and his cross was headed just wide by Tunnicliffe (48 mins). But then Meszaros won his side a corner at the other end, which came out to Hevicon. His cross from the left was met by Evans, whose goalbound effort struck Peter Band's knees as he stood on the goal-line at the near post, and rebounded out of goal (51 mins). A number of unforced errors then afflicted Altrincham but Hyde too were not able to make sustained movements at this stage of the game. Craney then did well to beat Hevicon and, after a fine run, his chip into the box was just reached by Lyons before the arriving Lunt (54 mins). Tunnicliffe then shot wide from 25 yards and the same player then headed wide, under a challenge, from a McEvoy cross from the right. For a small player, Tunnicliffe was doing well in the air. After Acton had missed a cross, a Hyde shot then hit the retreating keeper, as he collided with his post, to win the Tigers a corner on their left (59 mins). Yet another headed chance came Tunnicliffe's way when he dived to nod the ball past the post (62 mins). After good work by Scott had led to his being fouled, Acton took a free-kick from his own half. Band flicked this on and a Hyde defender clearly patted the ball down as it threatened to go behind him in the outer part of the box, to the right of goal. Amazingly, Mr Tarry did not award a penalty (62 mins). Following a foot-up offence against Tunnicliffe, McDonald took a free-kick from 35 yards out which led to a header by Band, which was cleared. However, McEvoy soon won his side a corner (67 mins). This came to nothing before Alty replaced the still unfit Gallagher with another debut-making Youth player, Francis Evans, a Merseysider who played a number of games for Altrincham Reserves last season (70 mins). There was then a strange booking for Scott which seemed to arise when a ball went out of play in the Alty half but struck the linesman, who was close to the line and rebounded back into play. Whether Scott was booked for playing on or for a comment was not clear (71 mins). Moments later Hayder was booked for a clear offence; kicking the ball away after a free-kick award against him. Altrincham were enjoying more of the possession in the second half without being able to carve out a clear opening. For Hyde, Steve Foster now replaced McGuire (74 mins) just before McDonald's neat turn led to his shot into the side netting. Francis Evans then won a corner for Alty with a deflected 20 yard shot before Foster reciprocated at the other end to win his side a corner, too. Acton palmed this away and on the break Lunt fed Tunnicliffe who was in a good position to advance into the box but slipped over before he could do so (78 mins). Alty won a corner before a Hevicon run led to Lee Evans winning a Hyde corner following a good tackle by Scott. After a foul on Tunnicliffe, Macdonald's free-kick resulted in Band winning a corner from a deflected shot. Then Francis Evans curled a shot at goal which also took a deflection, but the referee did not spot it and wrongly awarded a goal-kick. Soon Craney got in a low shot which was easily fielded by Lyons (83 mins). Hayder then got past Rose and after a good run at goal shot disappointingly wide for Hyde (86 mins). In the second of the two minutes of added time a punt upfield from Lyons led to Acton catching the ball half a pace outside his own area, in a central position, as Foster chased after it. The linesman flagged and Mr Tarry awarded a free-kick. After consulting his linesman, the referee showed the Alty keeper a red card. Chris Adams put on the goalkeeper's jersey but the free-kick was cleared without troubling him as it came off the defensive wall and was then knocked over the bar. Alty's misery was not yet over for Peter Band was apparently dismissed after the final whistle for verbal complaints to Mr Tarry. Losing a UniBond Cup match with a much weakened side is not the end of the world, especially as the price of defeat is to be put into another UniBond cup competition, the Chairman's Cup. However, the dismissals of Acton and Band will be a severe blow. Alty currently have no cover goalkeeper and Band is one of the club's most dependable players and was actually captain tonight. With Maddox, Talbot, Rowland and Ryan all currently sidelined, too, physio Gary Thompson will have a busy few days ahead of him before Saturday's encounter with Frickley. On the positive side, Alty had enough chances to have at least drawn this game and the performance of the three Youth players who got onto the pitch were encouraging and will have given great pride to the Youth team manager George Heslop and his coaches Neil Thomason and Mal Bailey.